When your child starts at school, going to friend’s parties and-significantly-eating away from home, you may be concerned that he or she is not eating the ‘right’ foods. These tips on nutrition for 5-12 year olds may help. After all the hard work you have put in-to steer your child clear of junk food and promote healthy eating habits when they were at home-it can be worrying that they are confronted with a choice of meals at school and have to cope with peer pressure about what they eat, how much, and when. School Dinners or Packed Lunch? Eating is as much about shared time and communication with peers and family as it is about food. If your child has been used to eating a balanced diet, they will be more confident about making their own meal choices at school. Most school menus cater for all tastes and can provide nutritious meals, but children will often go for the burger and chip sort of meal simply because that’s what their friends choose and they want to be ‘accepted’ by their peers. Avoid putting pressure on your child to be ‘different’. It may be possible to send him or her to school with a packed lunch, in which case, you will know you have at least provided a healthy option! Sandwiches or rolls, pitta breads or crackers, with lean meat, salad, tuna or cheese fillings, fruit, yoghurt, oatcakes and water or juice are appetising. When your child is out all day, you can make sure they have a good start by providing a healthy breakfast that will keep them ‘refuelled’ until lunch.Porridge is warming and nutritious-great for winter mornings. It contains soluble fibre and can be prepared in a very short time. Fresh fruit juice and smoothies are a good source of Vitamin C but do have a high acidity. Best served with a meal (like porridge!) to lessen the likelihood of tooth and gum problems.Toast, bagels and muffins are popular with children. Serve the breads toasted with butter and/oryeast extract, honey, jam or cheese triangles. Commercial breakfast cereals may promise all sorts of things-read the list of ingredients carefully as many of them contain very high levels of sugar and salt. Some cereals are high in fibre and low in fat, but may appeal to children better if you add some chopped banana, strawberries or other fruit too. Good quality muesli is great for breakfast-especially if you encourage your child to add extra fresh fruit. Grilled kippers, sardines on toast, scrambled eggs-or baked beans-on toast, bacon sandwiches; all of these make a change and provide goodness for active children at the start of their day. 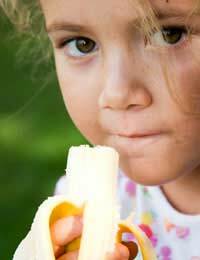 Between the ages of five and twelve, children’s dietary needs change significantly. These stages of their development require different numbers of calories and food types to ensure they have thenutrients they need for healthy growth and good health. Boys aged between 7-10 need about 1970 calories a day, girls of the same age need around 1740. How they get these calories is just as important!Protein, calcium and iron are especially relevant to the nutritional needs of fast-growing children, but these years are also the time when they may start to be influenced by others. Obesity, anorexia,anaemia and diet fads are, sadly, common problems. Try to remain positive about food. If your child is over-eating the ‘wrong’ food types, plan more regular exercise, as a family, rather than encourage dieting. Most fast foods contain high amounts of salt and calories-help to counteract this by providing healthy meals at home and sitting down together to eat. If your son or daughter is self-conscious about his or her body, not eating well, or you have any concerns about their weight, seek medical advice; without making them feel guilty.if you can encourage your child to eat five portions of fruit a day, fresh vegetables, lean meat, fish, pasta and pulses, washed down with milk, fruit juice and water, their teenage years should be healthier and happier for all!